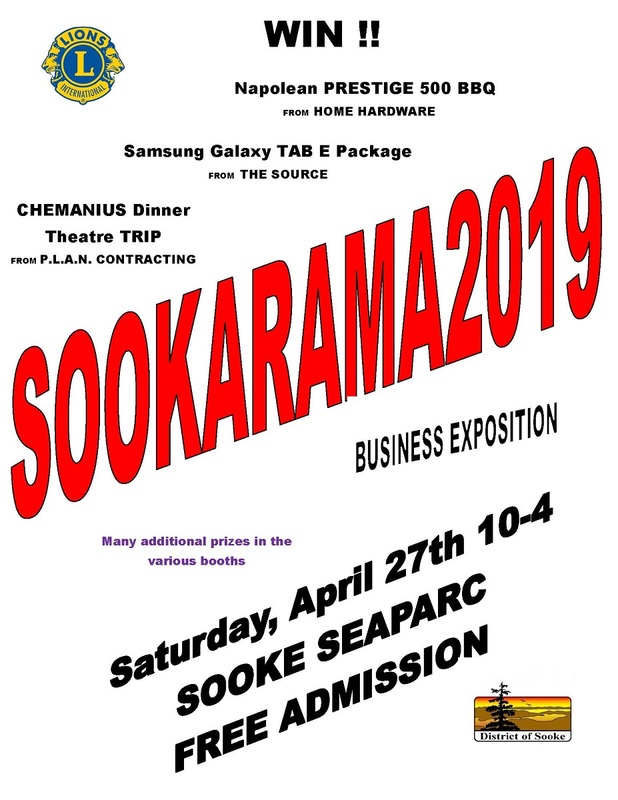 Sookarama2019 is a business exposition sponsored by the Sooke Lions and the District of Sooke. To have a healthy community we need a robust business climate. This trade show is an effort to provide local businesses with the opportunity to show the community what they have to offer. There will be many door prizes at the individual booths. Also there are four main door prizes. A Napolean Prestige BBQ has been donated by Sooke Home Hardware. The Source is providing a Samsung Galaxy Tab E with accessories. P.L.A.N. Contracted has supplied a night in Chemanius complete with Dinner Theatre tickets. Collar and Comb is offering a pet orientated gift basket. Admission is FREE. This event takes place Saturday, April 27, 2019 at SEAPARC from 10:00 am to 4:00 pm. Proceeds from the event goes to fund the many worthwhile charities that the Sooke Lions support.